Loose laws let scores of charters create policies that favor white students. Lake Oconee Academy was the brainchild of the Reynolds Lake Oconee real estate company. GREENSBORO, Ga. — This clearly was no ordinary public school. Nestled among gated communities, golf courses and country clubs, the school felt like an oasis of opportunity in a county of haves and have-nots, where nearly half of all children live in poverty while others live in multimillion-dollar lakeside houses. At least 747 public charter schools around the country enroll a higher percentage of white students than any of the traditional public schools in the school districts where they’re located. Lake Oconee Academy is one of these Georgia charter schools. 73% of its students are white, while white children account for 12% of students at the traditional public schools. The school’s halls and classrooms are bright and airy, with high ceilings and oversize windows looking out across the lush landscape. There is even a terrace on which students can work on warm days. After a guide pointed out several science labs, the tour paused at the “piano lab.” The room holds 25 pianos, 10 of them donated by residents of the nearby exclusive communities. The guide also noted that starting in elementary school, all students take Spanish, art and music classes. The high school, which enrolls less than 200 students, offers 17 Advanced Placement courses. Lake Oconee’s amenities are virtually unheard of in rural Georgia; and because it is a public school, they are all available at the unbeatable price of free. Conspicuously absent from the open house were African-American parents. Of the dozen or so prospective families in attendance, all were white except for one South Asian couple. At Lake Oconee Academy, 73 percent of students are white. Down the road at Greene County’s other public schools, 12 percent of students are white and 68 percent are black; there isn’t a piano lab and there are far fewer AP courses. Lake Oconee Academy is a charter school. Charters are public schools, ostensibly open to all. The idea behind charters was to loosen rules and regulations that might hinder innovation, allowing them to hire uncertified teachers for example. But dozens of charters have also used their greater flexibility to limit which kids make it through the schoolhouse doors — creating exclusive, disproportionately white schools. They do this in a variety of ways: Some pick from preferred attendance zones. Some don’t offer school bus transportation. Others require expensive uniforms. A joint investigation by the Hechinger Report and the Investigative Fund found that hundreds of charter schools nationwide have a student body that is whiter than any of the traditional public schools in the same district. These 115 charters, which together enrolled nearly 48,000 children, were concentrated in just a handful of states. In 2016, California had 33 racially identifiable white charters, Texas was home to 19 and Michigan, 14. At nearly 63 points, the gap between the percentages of white students at Lake Oconee Academy and at the whitest traditional public school in the area was the fourth-widest in the country. In all, there are at least 747 public charter schools around the country that enroll a higher percentage of white students than any of the traditional public schools in the school districts where they are located. These schools represented one in 10 charters operating during the 2015-16 school year. Not all of these schools are necessarily contributing to school segregation. In cities where many of the public schools almost exclusively serve African-American children, these disproportionally white charters are the only racially diverse schools. But many of the 747 charters have implemented policies that critics say make it difficult for lower-income families to access them. Felton’s reporting was featured in Colorlines, POLITICO, Poynter, and The Daily Caller. But some residents say that policies at the school make it hard for black families to enroll their kids: Land’s End uniforms they can’t afford, and the fact that the charter doesn’t provide bus transportation to and from school, while the other public schools do. To many in this starkly divided county, this public charter school doesn’t seem all that public. In its early years, Lake Oconee Academy created a priority attendance zone for the gated communities that surround it. This is legal in several states, allowing charters to pick the neighborhoods they want to serve. While these schools usually hold randomized admissions lotteries open to everyone in their school districts, families in preferred attendance zones get first dibs. Several of the 747 charters only offer their admissions materials in English, excluding immigrant families who speak other languages. And some of these charters pressure parents to volunteer a certain number of hours, which can be hard on working families. Politicians often sell charters as a solution for low-income black and brown students stuck in poor-performing public schools. Yet, by 2015, racially identifiable white charter schools had emerged in 18 states — at a time when charters existed in 42 states. The federal government has played a role in the growth of these charters by granting charter startup grants to schools without considering whether they will lead to increased segregation. 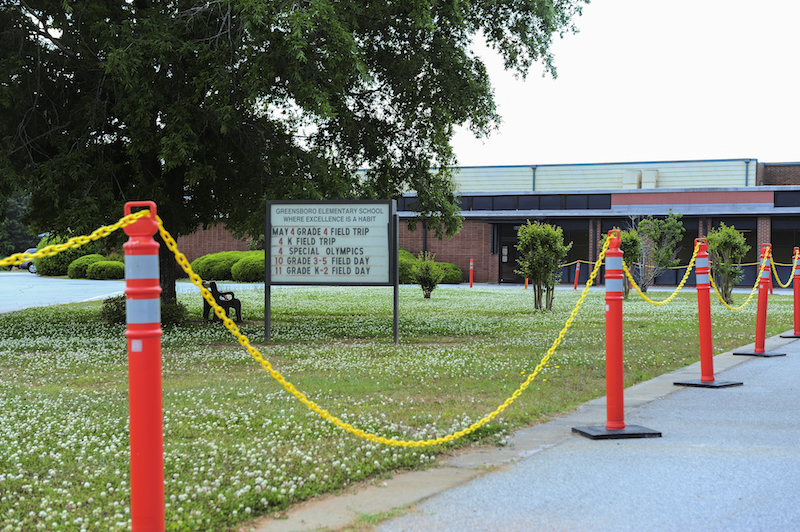 Some have been approved even while their communities were still under active school desegregation court orders, and in one case even after residents implored the federal court to step in and bar the school from opening. Todd Ziebarth, senior vice president for state advocacy and support at the National Alliance for Public Charter Schools, says that, in some parts of the country, organizations that oversee charters have started to take a more active role in ensuring that the schools enroll a diverse student body. Still, he thinks there’s more to be done. 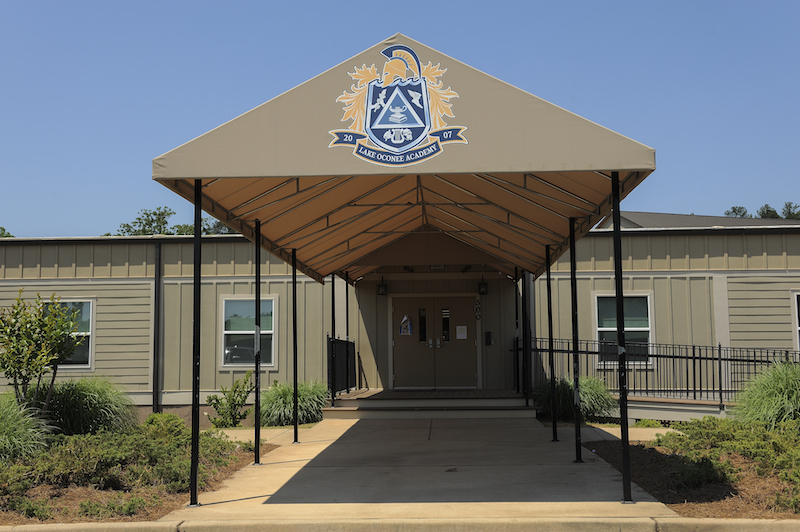 Enrollment at Lake Oconee Academy has grown from 11 in 2007 to nearly 1,000 students today. Meanwhile, enrollment at the area’s other public schools is down to approximately 1,600 total students, from 2,107 in 2007. The drop in enrollment has contributed to years of staff and budget reductions. This year, in February, the school board voted to close two of the district’s five majority-black public schools. There’s disagreement over whether the charter school is responsible for pulling resources away from the traditional public schools. This year, the charter received $12,500 per student in public funds, while other district schools received $18,500 per pupil, according to Michael Lynch, chairman of the Greene County School Board, which oversees both the charter school and the traditional public schools. 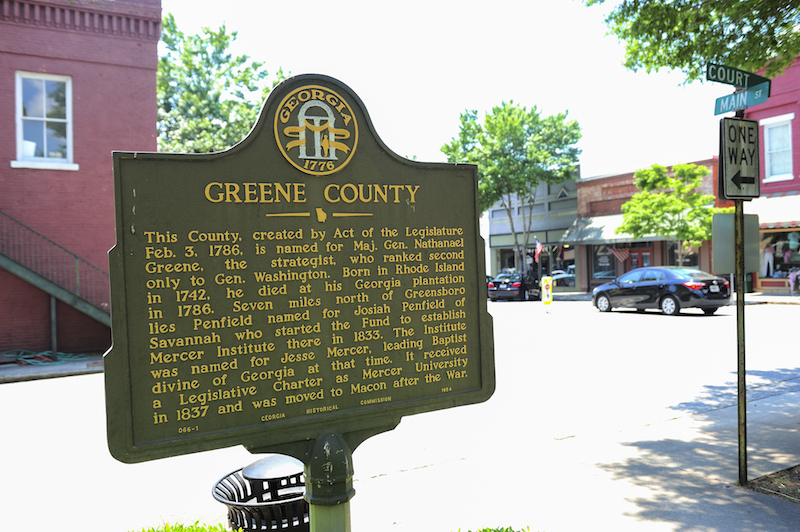 Greene County is a rural county located in the Black Belt. For the first nine years of its existence, the charter school would get a set amount of funding, no matter how much other money the school board received through taxes and support from the state and federal government. Over the years, the school board and other county officials have gotten into legal trouble due to attempts to steer money to Lake Oconee. 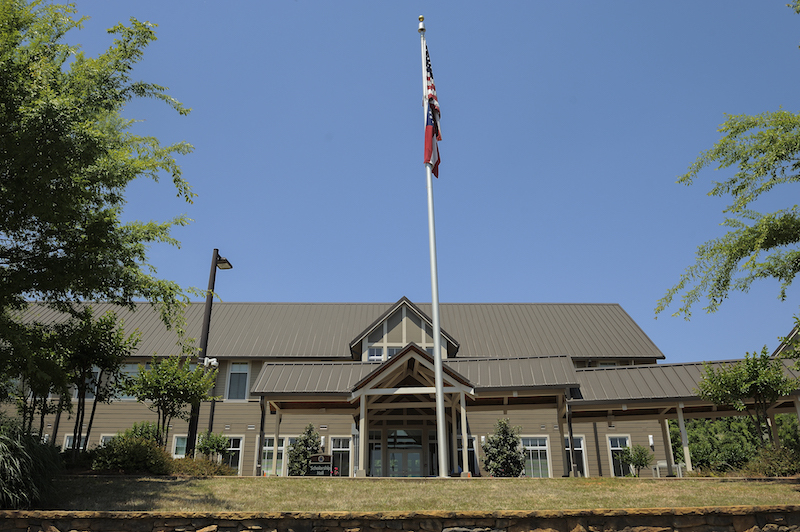 In 2014, just five years after the county issued $17 million worth of bonds for Lake Oconee, the state supreme court struck down the county’s attempt to issue another $14 million worth of bonds for the school. The other Greene County public schools serve more students with higher needs. In the traditional schools, 13 percent of students received special education services in 2016-17; at the charter, that number was 7 percent. Seven percent of students at the other district schools are English language learners compared to 4 percent at Lake Oconee. 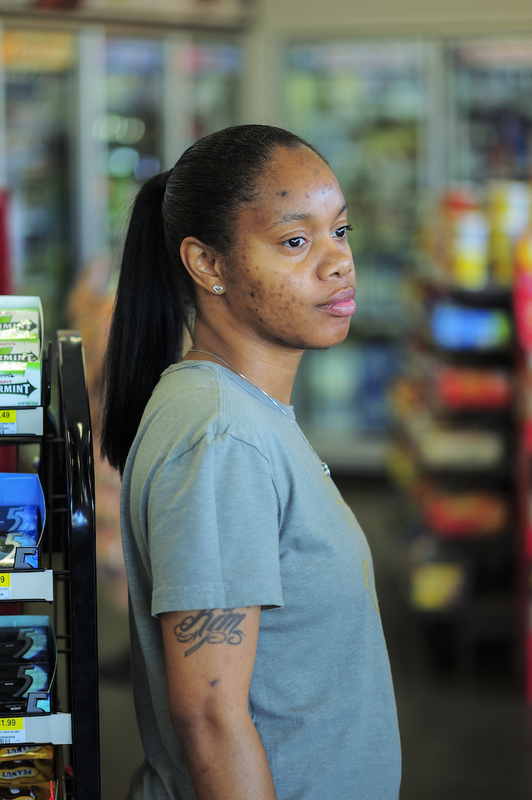 Kim Smith is a black mother of three who makes $13.75 an hour as a cashier at a gas station just up the road from Lake Oconee Academy. For Smith, the gap in resources between the mostly white charter and mostly black traditional schools are proof of what the Supreme Court decided more than 60 years ago, that separate can never be equal. Kim Smith, a mother of three, has set up a Facebook page to support Greene County's traditional public schools. In Lake Oconee’s early years, Smith, 32, didn’t give much thought to the charter. At one point, she says she received a letter from Lake Oconee Academy offering spots to her two eldest children, who were both honor-roll students. Without school bus transportation, it just wasn’t an option for her family, so Smith threw the letter away. But she started to worry as Lake Oconee seemed to drain resources from her kids’ schools. In addition to the gas station job, she works cleaning houses in the gated communities and sees close-up how much wealth the area has. The more she’s seen, the angrier she’s become. Smith likes her children’s schools, but she wishes they had access to the same amenities offered to Lake Oconee Academy students. “I can’t buy 25 pianos,” she said. Reynolds Lake Oconee, originally named Reynolds Plantation, was founded by Republican mega-donor Mercer Reynolds III. In the 1980s, the company started building luxury real estate on Lake Oconee. At first, many of the houses in the area that locals call “The Lake” were purchased as vacation homes, or by retirees. But by the early 2000s, the Reynolds company was looking to expand by building homes targeted at younger families, recalls John Jackson, who served as Greene County superintendent at the time. He says Reynolds executives approached him about starting a school in the lake area. Jackson said he wouldn’t consider opening a new school, but offered to set up a gifted program that would be open to all Greene County students. 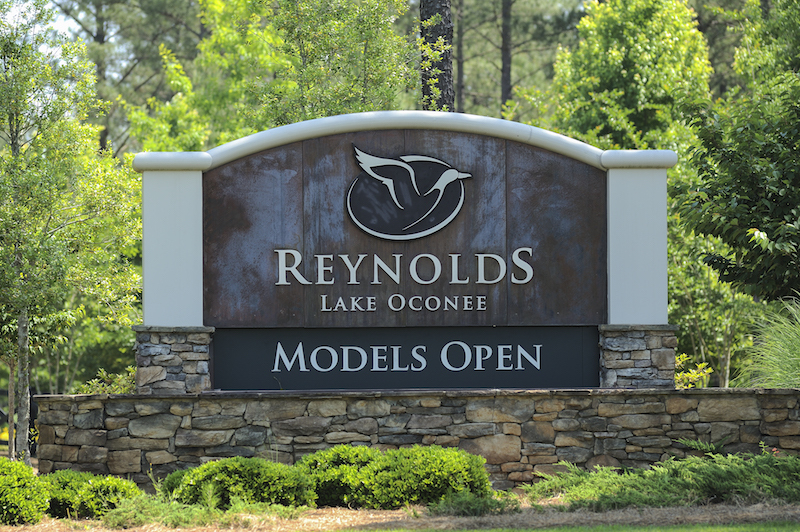 Reynolds Lake Oconee, originally Reynolds Plantation, has been building luxury property in Greene County since the 1980s. According to its 2007 charter application, 80 percent of Lake Oconee Academy’s seats would go to children living in Zone 1, which was mainly comprised of Reynolds’ properties; 12 percent would go to kids living in the mostly white neighborhoods nearby; and the final 8 percent of seats would be for families in the rest of Greene County. Those attendance zones all but guaranteed that the school would serve a whiter and more affluent student body than Greene County’s traditional public schools. In the summer of 2007, a group of Greene County residents traveled to Atlanta to protest what they saw as a plot to re-segregate their schools. Despite the pushback, state education officials approved the charter. In the school’s first year, just 11 students enrolled — all were white. By 2015, Georgia was hosting two other racially identifiable white charter campuses. Enrollment at Pataula Charter Academy in Edison, Georgia, was 77 percent white, while the student body in the district’s next-whitest school was less than 2 percent white — the second-largest enrollment divergence nationally at the time. Baconton Community Charter School, with a 63-point gap between its percentage of white students and that of the other schools in its district, had the fifth-largest gap. In 2016, Southwest Georgia STEM Charter School launched in Randolph County. The charter opened on the former campus of a private school, which, according to data provided to the federal government in 2012, didn’t enroll a single black student. Today, the new school, with an enrollment of 199, is 75 percent white. Meanwhile, there are only 20 white students enrolled in the rest of Randolph County’s district schools, in which 95 percent of students are black. In an emailed statement, Louis Erste, associate superintendent for district flexibility, charter schools, policy and governmental affairs with the Georgia Department of Education, said the state requires that charter schools provide an equal opportunity to all students and expects them to “make every attempt to market and recruit to the entire community that the school serves.” However, he acknowledged that various factors can influence “the students who choose to enroll in a charter school,” and have an impact on school diversity. The state has set specific diversity benchmarks that schools “with diversity issues” — including Lake Oconee Academy — must meet, according to Erste. The proliferation of racially identifiable white charters in some states but not others can be attributed in part to differences in state laws. In addition to allowing charters to draw their own attendance zones, Georgia doesn’t require charter schools to provide school bus transportation. The four states with the most racially identifiable white charters — Michigan, Arizona, Texas and California — also don’t require charters to offer transportation or to address the issue in their charter applications. And in North Carolina, which had six such charter schools in 2015, lawmakers have discussed allowing charters to give priority to children whose parents work at corporations that have contributed at least $50,000 to the school. 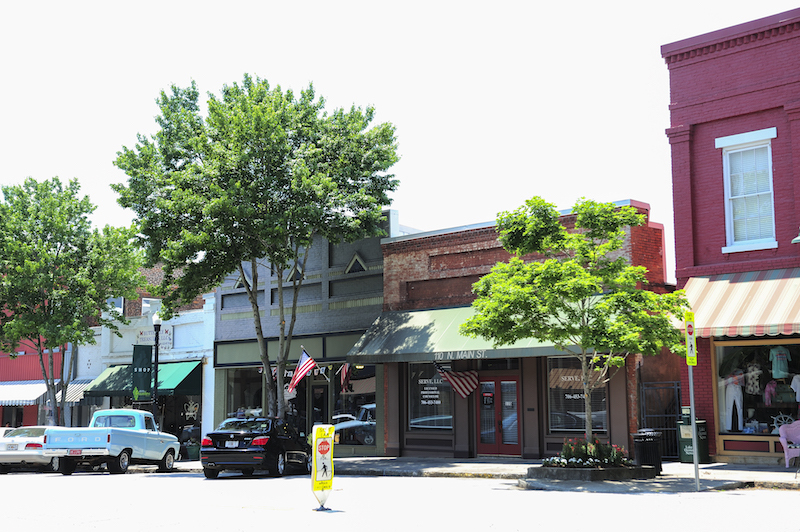 While neighboring counties have declining populations, Greene County, Georgia, is growing. In Lake Oconee’s original charter petition, Neal projected rapid growth at the school, but the 2008-9 housing crash and recession stymied the company’s plans to build new homes. Greene County residents say that’s when they started receiving recruitment letters from the charter targeting high achievers. 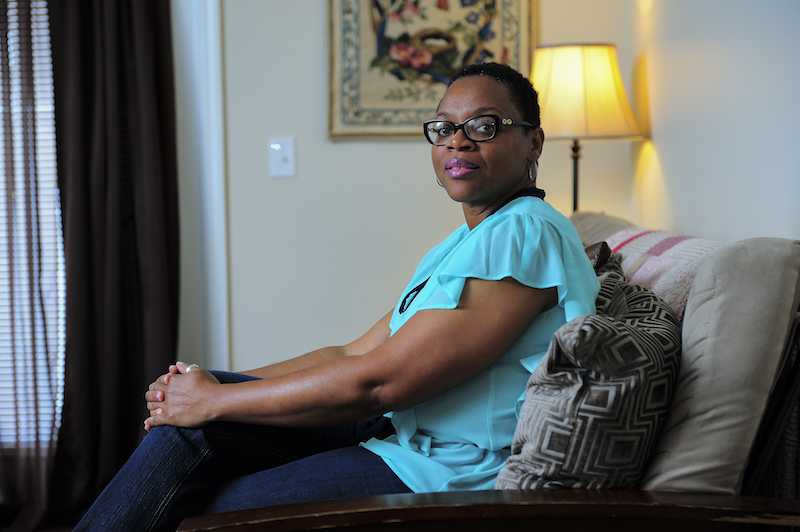 Kim Smith was just one of several black parents who say they got letters. But most of the families who eventually enrolled were white. Many had sent their kids to the local public schools, but others came from the nearby, virtually all-white private school, Nathanael Greene Academy. According to data provided by Nathanael Greene to the federal government, enrollment at the school dropped from 274 in 2007 to 139 in 2015. Even after this outreach, the ranks of black students at Lake Oconee remained low. Some black families, however, did join the school. Tasheka Redd, a black mother of five who works in the concierge department at Reynolds Lake Oconee, enrolled one of her daughters at the charter in 2013. She was lured not just by the school’s test scores but also by the praise her co-workers at Reynolds heaped on it. “When I first got there, there wasn’t even 20 black families at the school,” she said. But she was impressed from the beginning. “It was wonderful for us,” said Redd. “As time went on, my other children weren’t getting what they needed in school. … So I said, you know what, I’m sending them to LOA [Lake Oconee Academy].” She eventually moved three of her kids to the charter school. (Her oldest son, who played football, a sport not offered by the charter, went on to graduate from Greene County High School in 2017.) Because she works nearby, and also gets help from her mom and sister, Redd says transporting her kids to school is less of a challenge for her than for many families. She says Lake Oconee was particularly beneficial for her son diagnosed with autism. Sandra Lawson, a mother of two, applied to Lake Oconee Academy in 2016. Lawson had moved her family to Greene County in 2008 after taking an administrative support position at the Greensboro Housing Authority. She enrolled her daughter, Nevaeh, in pre-K at Greensboro Elementary School just as Lake Oconee Academy was getting off the ground. Lawson agrees with the charter school’s advocates that the Greene County Public Schools were struggling even then. But she says that as time went on, the district schools got worse. She fought for years to get her son evaluated for a learning disability, and she was increasingly worried about what opportunities her daughter was missing. After years of principal turnover at her kids’ school, Lawson applied for two spots at Lake Oconee in 2016. According to Lawson, she got a call after submitting an application in March 2016 from Robin Weir, who oversees the charter's admissions and enrollment. Lawson said Weir told her that Jayden, Lawson’s son, would need to be kept back a year. Though disappointed, she kept both of her children in the admissions lottery. About a week later, she said she received a letter from the school. Nevaeh was put on the waitlist at the number 14 spot for her grade; Jayden landed the seventh spot for his grade. By 2014, Lake Oconee Academy had grown to 574 students. But as it prospered, tensions rose. In early February of that year, pastor Roi Johnson led a one-man protest against the charter. Over several weeks, the demonstration grew to dozens of people. On February 24, about 80 protesters gathered for the final demonstration at the entrance of the school. They were met by more than 12 Greene County Sheriff’s deputies and six Georgia State Patrol troopers, according to a local news report. Protesters held up signs imploring Lake Oconee Academy to “end the bigotry.” Two years later, the school agreed to dismantle its attendance zones and to change the school’s funding model. Lake Oconee is one of several racially identifiable white charters that have been forced to change their practices. In 2007, a charter school in Red Bank, New Jersey, promised to recruit more Hispanic students after the local school board sued the school to demand that it increase its diversity. Nearly a decade later, local parents lodged a complaint with the school’s board, arguing that the charter still hadn’t adequately addressed the issue. In Marin County, California, the state stopped the local school board from sending additional dollars to a local charter school that served a disproportionately large number of white students compared to the district’s traditional public school, which is 70 percent black and Hispanic. The Greene County School Board voted to close Greensboro Elementary School earlier this year. Today, Lake Oconee Academy is 73 percent white, down from 81 percent white in 2014. The added diversity is largely due to more Asian and Hispanic students. The black population has grown from 7 percent of total enrollment in 2014 to 10 percent. Further diversifying the school will be difficult. Each year, there are few open spots after it enrolls the children of teachers and board members, who are mostly white, and siblings of current students. A statement provided by Tucker said that Lake Oconee Academy is seeking to increase the population of educationally disadvantaged students by 4 percent each year by reaching out to churches and community groups, advertising throughout the county and participating in local fairs and events. In its new charter agreement the school promised to increase its ranks of nonwhite students. But this year’s preschool class, the grade at which most children enter the school, was even whiter than the school as a whole, at 78 percent white. District parents like Kim Smith still see a fight ahead for their children’s education. “They are going to take away from us to build this up,” she said. After noticing that Lake Oconee boosters often packed school board meetings, but few district school parents attended, Smith decided to start a Facebook page to get more local parents involved. It now has more than 300 members and has become the grass-roots home of the resistance. For Sandra Lawson, it’s not worth the fight. Her children never made it off of Lake Oconee’s waitlist, so, rather than apply again the next year, she decided to leave Greene County entirely. Lake Oconee Academy is expanding. A new high school facility is under construction. She moved her family to neighboring Putnam County, where there is no charter school. Putnam County district schools have better test scores than Greene County’s traditional public schools and are more integrated, with both white and black students each comprising about 40 percent of enrollment at the county’s four public schools. She says both her kids are thriving there. After years of waiting for an evaluation from Greene County Schools, Jayden was diagnosed with autism and is getting the supports he needs in Putnam County. Both kids are on soccer teams, and Nevaeh also has cross-country and chorus on her tight schedule. At Lawson’s desk in her tidy three-bedroom apartment she keeps an oversize calendar to keep up with all their activities. This story about school segregation was produced by The Hechinger Report, a nonprofit, independent news organization focused on inequality and innovation in education, and The Investigative Fund, now known as Type Investigations, a newsroom for independent journalists, in partnership with NBC Nightly News/NBCNews.com. Emmanuel Felton is a 2017-2018 Ida B. Wells fellow with The Investigative Fund and a staff writer at The Hechinger Report.